Movies like Armageddon may dramatize the idea of an asteroid hitting the Earth and overdramatize ways we might avoid it. The reality is, this is a bona fide concern and agencies around the world are building contingencies. The human race is preparing to protect the planet, even as we slowly snuff ourselves out through greenhouse gas emissions. Our species is so weird. 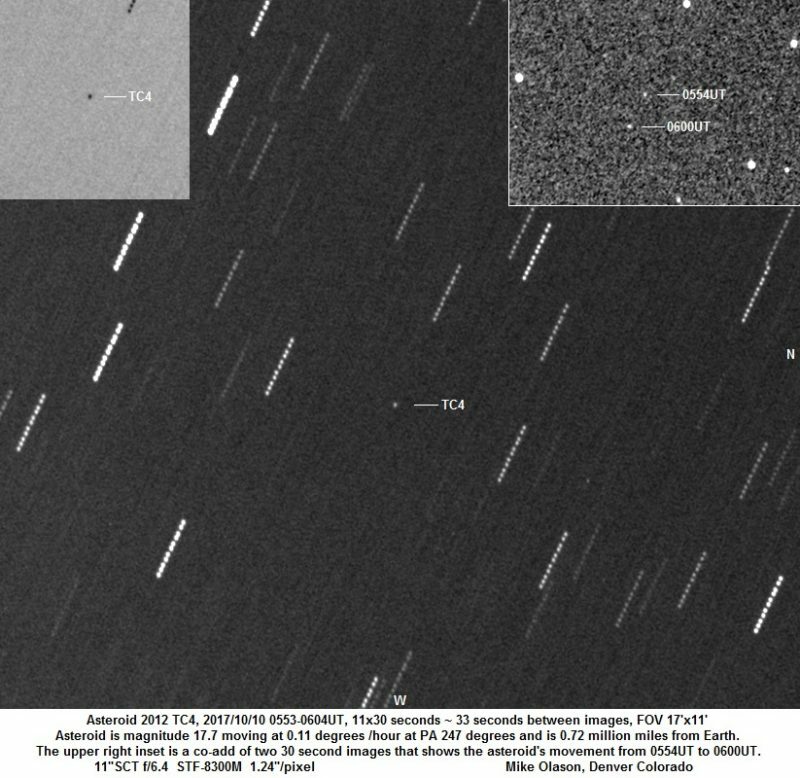 At 5:41 UTC (1:40 ET) a small asteroid named 2012 TC4 sailed 26,000 miles (42,000 kilometers) above our planet’s surface, traveling over Antarctica, and coming really close to the orbital altitude communication satellites inhabit. Said differently, it was at about one-tenth the distance from Earth to the moon. 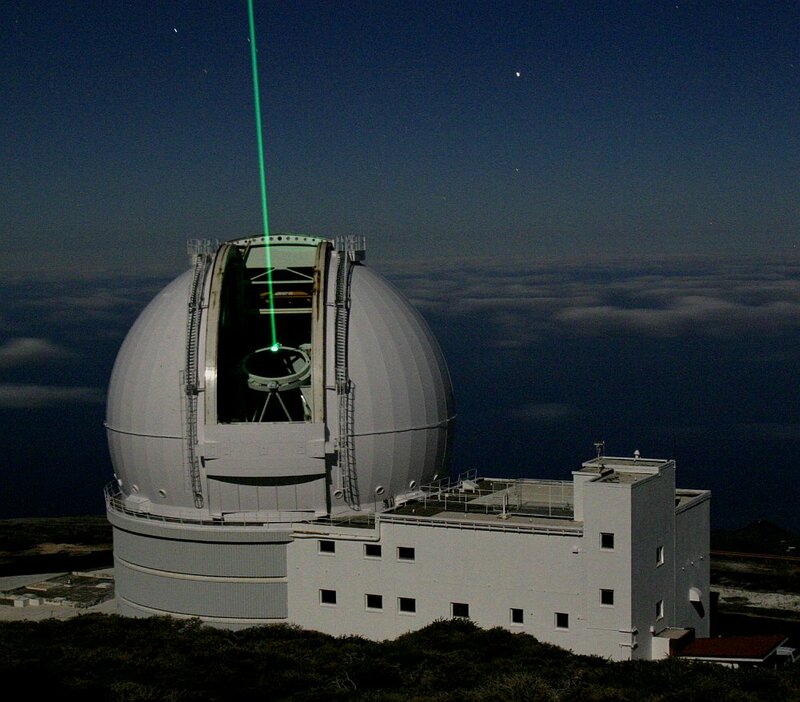 The Ground-Layer Adaptive Optics system in use at the William Herschel Telescope. Credit: Javier Méndez. What was a big deal was that this event gave scientists the ability to test what’s known as the international asteroid warning network. Tens of telescopes were watching the sky all over the globe, to observe and monitor the asteroid. Scientists not only tested their ability to sense the body but to communicate their visual, infrared, and radar collected findings, with colleagues around the world. The idea is to have ample warning time to avert a global catastrophe like the one that wiped out the dinosaurs, 65 million years ago. With enough time to prepare, 5-10 years say, a plan could be developed to shift a worrisome body’s trajectory enough so that it’ll miss Earth. It’s important to note that no known asteroid is predicted to hit our planet anytime within the next 100 years. Back in 2012, NASA’s Panoramic Survey Telescope and Rapid Response System (Pan-STARRS), on Hawaii, first recognized the asteroid. Pan-STARRS is part of NASA’s Planetary Defense Coordination Office (PDCO). 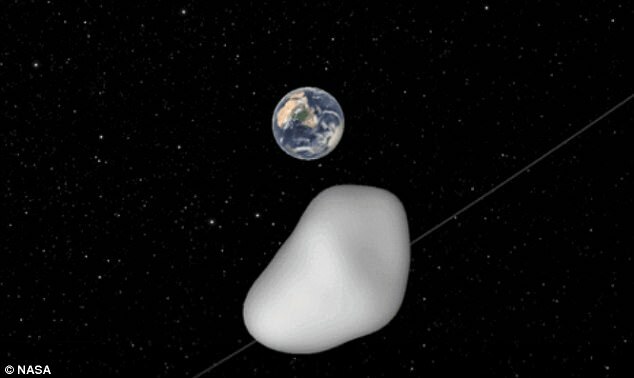 Soon, the giant space rock moved out of range of the telescopes that detected it. The asteroid seems to orbit the sun every 1.67 years or so. JPL scientists calculated in July that it would have a close shave with Earth this October. They tracked it for seven days to firm up their calculations. NASA PDCO program scientist Michael Kelley—who led the original TC4 observation, said it was important for worldwide systems to track the flyby, in order to assess “our capability to work together in response to finding a potential real asteroid-impact threat." 2012 TC4 flying by Earth. 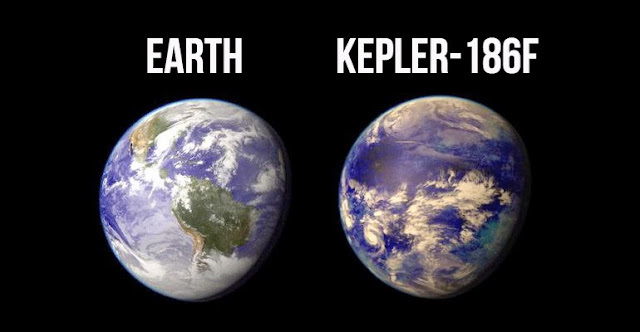 Credit: NASA/JPL-Caltech. NASA’s NEO Observations brought together the first, participating teams. But other countries’ space agencies and institutions have since joined up. Vishnu Reddy is an assistant professor at the University of Arizona's Lunar and Planetary Laboratory in Tucson, Arizona. He’s also a principal for the near-Earth asteroid characterization project at NASA. In this flyby simulation, Earth is the blue dot. A geosynchronous satellite and its orbit are purple. The moon’s orbit is white. The asteroid’s path sweeps by on a green path. Watch how the orbit of 2012 TC4 gets deflected as it passes by Earth, turning darker as it dips below the ecliptic plane. Image Created with orbitsimulator.com, via Tony873004/AstroBob. Asteroid observers conducted a “pre-test” back in September. At that time, they observed 3122 Florence, one of the largest known near Earth objects (NEOs). Its 2.8 miles (4.5 km) in size. What this effort revealed was, Florence has two moons. Though Harris admitted in his talk with Astrowatch, asteroid 2012 TC4 wouldn’t cause any damage, an asteroid about the same size struck a small city in Russia back in 2013. The Chelyabinsk meteor caused thousands of injuries and widespread damage to the city’s buildings. Still, Harris notes that over most areas on Earth (unpopulated ones), such a meteor would prove relatively harmless. 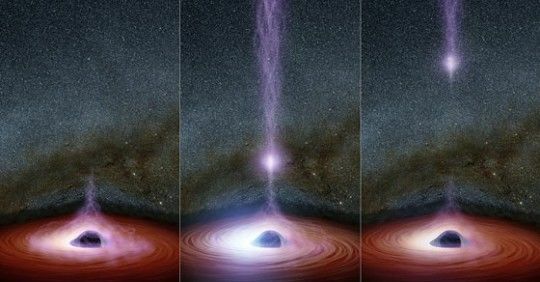 With the data collected from this latest flyby, scientists are better able to predict trajectories of concerning outer space objects large and small, forecast whether they have the potential to hit Earth, and decide what preparations should be made to avoid a collision.